Acculift partners with many different suppliers of material handling and air purification equipment. We design a solution for our clients choosing the best equipment to deliver the optimum solution for our client’s challenges. In this series of news posts, we’ll highlight our relationships with our primary suppliers, and discuss the advantages each brings to our partnership. Gorbel is an innovator and leader in the enclosed track work station crane industry. Gorbel has comprehensive lines of Crane Technology products, Ergonomic Lifting products and, a line of Fall Arrest Safety Systems. Gorbel® Work Station Cranes are a proven way to improve productivity, increase quality, and provide a safer work environment. Both the aluminum and steel crane’s utilize a patented enclosed track that is high in strength and low in weight. Gorbel continues to be the benchmark of overhead cranes. They’ve built a reputation based on quality products, top notch service, engineering experience, and application knowledge. This combination allows Acculift to provide flexible integrated solutions that are consistently delivered on time and to accurate build specifications. Gorbel is a cornerstone product and solutions provider to the Acculift team. Headquartered in Fishers, NY, and founded over 40 years ago, their first manufactured products were manually rotated jib cranes. Quickly they then developed enclosed track, aluminum products, and more. Over the years they have continued to be an innovation leader with their intelligent lift devices, fall arrest systems, and ongoing development of lifting equipment. In 2006, they were named International Business of the Year, and expanded to Beijing, China. Recently, their product lines have extended into medical lift technologies and mobile fall arrest vehicles. Gorbel provides extensive sales training and hands on assembly training for all of their product lines. Their multi-day training seminars cover all aspects of designing, selling and installing of their product lines. All of our technicians, sales people, and even our marketing team have gone to their headquarters in Fishers, NY, and have taken their certification programs. 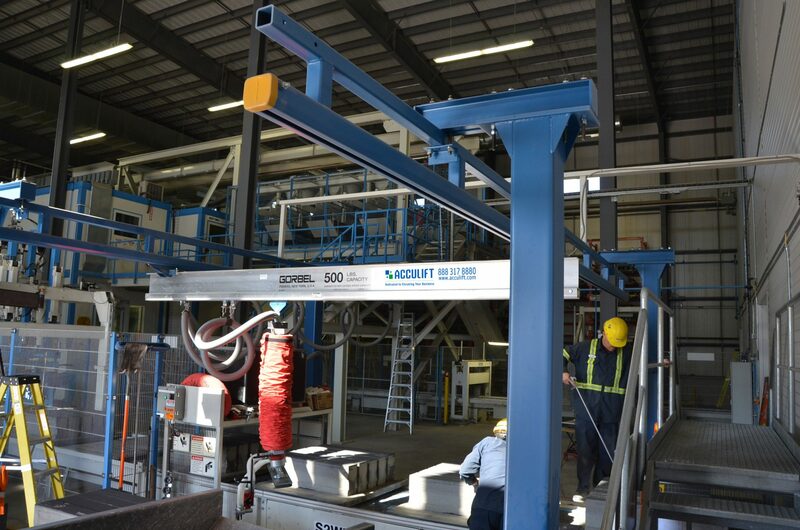 Acculift is easily the most educated and dedicated provider of Gorbel solutions on the Canadian prairies.